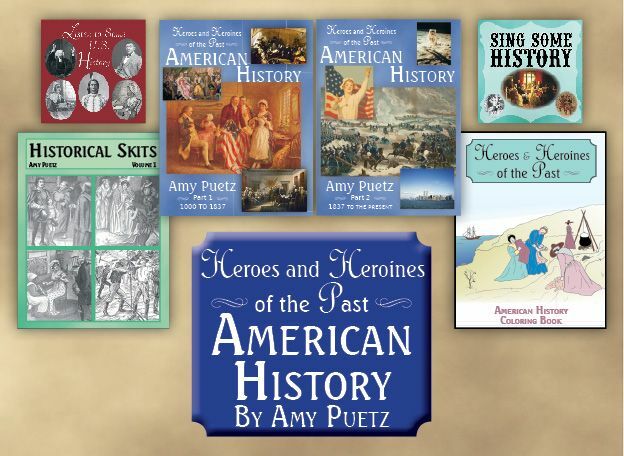 As part of the Homeschool Review Crew, we recently got to review Heroes and Heroines of the Past: American History Curriculum from Golden Prairie Press. The curriculum is thirty weeks long and for grades one - six. Each lesson has two sections - one for first and second grade has a larger type font and gives a basic overview and another for third through sixth graders with the same information but presented in a more advanced way. I found this to work well with my two older children. My son is finishing up second but is a big history buff and read the lesson for third to sixth. My younger daughter is getting ready to start Kindergarten and she was able to glean quite a few facts from the younger lesson. The Heroes and Heroines of the Past: American History Part 1 & Part 2 Ebooks are split and contain the first and second half of the year's lessons. The stories within the text are old and new, written about different historical heroes or heroines. My son liked the definitions that were listed alongside for the more challenging words. The activities included with the lessons are great. I love for History to be more hands-on and involved because I feel the kids retain more that way. The Historical Skits Ebook features nineteen skits from Christopher Columbus to World War II. We read through these and acted them out as much as we could, but I think where this will really be enjoyed is with our homeschool group. They've done plays before (an adaptation of The Hobbit last year and some skits) and we have a wide variety of different ages there so I think they'd really enjoy these. Listen to Some U.S. History MP3 Audio Download contains audio versions of original speeches, poems, sermons, and other documents that are talked about in the text. This is also great to listen to in the car. Zeke especially liked listening to the historical speeches. The Additional Materials Downloads is chock full of printable timelines, instructions, videos, coloring pages, and more. The coloring pages were great for the kids (especially my younger daughter) to use while listening to the songs or speeches, or while I read the text aloud. And my son loves the timeline - he is very much into dates and times in History. This curriculum is downloadable and is available for $98.99 and includes everything I listed above. There is also a black and white print edition available for the same price. (The downloadable version is in color.) There are 150 lessons, or roughly enough material for one to two years of study - depending on your children's ages, grade levels, and progression.